All_My_Collections' booth, featuring 918 items, including L&M Filter 100's Canasta Vintage Cigarette Plastic-Coated Playing Cards NIB, A Short Table Of Integrals BO Pierce 3rd Revised Ed 1929 Mathematics Textbook, Howie Day Australia Debut Album 2000 CD, Attacking Anxiety Coaching Videos With Lucinda Bassett Volume 1-3 Sessions 1-15, Knights At The Castle by The Highland Rovers Band CD, 1980-1985 Mercedes-Benz W126 Series Horn Pad Button Emblem OEM, Apple Airport Extreme Base Station Dual Band 2009 Wireless Router A1354, Vintage 1905 History Of The United States Of America V.1&5 Henry William Elson, 1983-1987 AMC Renault Encore Plastic Script Emblem OEM Rat Rod, Genuine Sony CD Discman AC Power Adapter Cord AC-E455, 1980's Ford Script Nameplate Emblem OEM, Job For A Cowboy Ruination 12 Green Colored Vinyl LP Record, Victoria Williams: Sings Some Ol' Songs 2002 CD, Block Island Rhode Island Model Collectible Lighthouse On Base, 100 Things I'm Not Going To Do Now That I'm Over 50 Wendy Reid Crisp 1995 1st Ed, 1960's Chevrolet Chrome Metal Headlight Wiper Switch Knob OEM Rat Rod, Genuine Nintendo 3DS Operations Manual Paperwork + Nintendo AR Cards, 1968-69 Chevrolet Corvette Camaro Impala Buick Side Marker Lights OEM 5960376, Evernham Motorsports NASCAR Holloway Men's XL Red White Polo Golf Shirt, Bundesrepublikanisches Lesebuch Drei Jahrzehnte Geistiger Auseinandersetzung, 1975-1979 Chrysler Cordoba Chrome Metal Script Emblem OEM 3811450, 1980's Plymouth Plastic Script Emblem OEM Rat Rod, 1983-1985 Dodge Charger Plastic Nameplate Emblem OEM , Christian Truth For Christian Living Edwin Lewis 1942 Theology Evangelism SC PB. 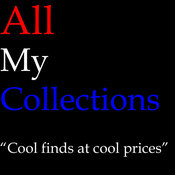 A notification has been sent to All_My_Collections about your wish to chat with them. If they are available, they should be around within 5-10 minutes.